Southeastern Kentucky's Red River Gorge is designated as a National Scenic Byway. The exquisite beauty of its dramatic landscape, including its awesome arches and breathtaking sandstone cliffs, is the result of millions of years of sculpting by wind and water. 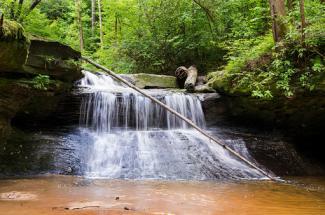 The gorge is located within a 28,000-acre section of the Daniel Boone National Forest. 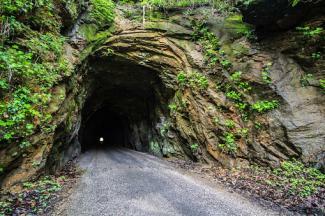 You'll enter the spectacular Red River Gorge area via the 900-foot Nada Tunnel (on Highway 77), which is open to one-lane traffic only. It was originally built to be used by a logging railroad during the early 1900s. Once you're in the gorge, you'll find the largest concentration of magnificent rock shelters and natural stone arches east of the Rockies. These may be viewed by driving along Highways 77 and 715, or via the more than 6o miles of scenic hiking trails that are available. The Red River Gorge's fantastic network of trails even includes a section of the Sheltowee Trace National Recreation Trail. You'll also find a wide variety of plant and wildlife here-and evidence of its ancient inhabitants in the old stone staircases and pictographs that you'll see. 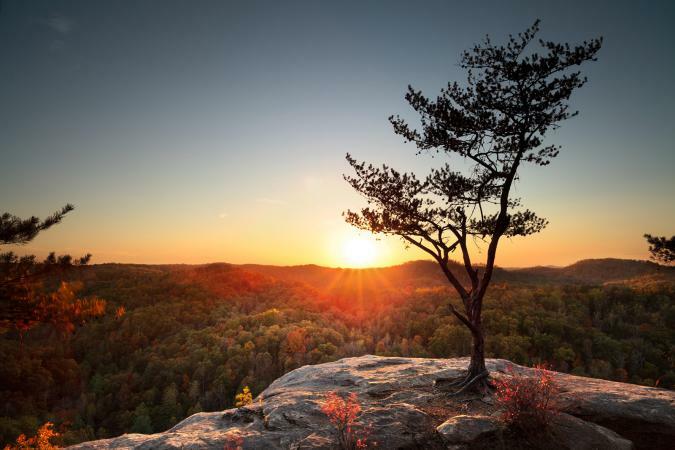 For some of the best views, try one of the Red River Gorge hiking trails. One of the more popular ones is Raven's Rock; however, this is a very challenging hike, and you'll find that the cliffs are lined with railings because of the danger. Natural Bridge, the renowned 900-ton natural arch, also features spectacular lookouts; they're reached via several trails and a sky lift. The summit is accessed through "Fat Man's Misery." Sky Bridge, an impressive rock span of 75 feet, offers magnificent views of the Clifty Wilderness, which is a rugged and undeveloped area that features many natural arches and towering cliffs. 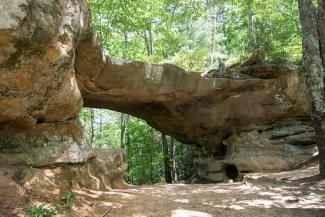 And Lover's Leap offers you one of the highest overlooks in the entire Red River Gorge. Castle Arch, a massive arch with very rough edges, may be seen as you drive along Highway 715 (near the turnoff for Sky Bridge). Rock Bridge, a natural wonder that spans Swift Creek, has a self-guiding loop trail that leads to the arch. Haystack Rock is a dome-shaped rock. Double Arch has a thinner arch above the first one, and it's reached by ascending a series of steps at the end of the designated trail. Stairs also lead you to the bottom of yet another interesting formation, Courthouse Rock. For a shorter hike, consider visiting Princess Arch and Little Princess Arch. Rock climbing is a popular activity at the Red River Gorge as well. If you're considering a climb, check out Red River Climbing, an online resource offering great insight on necessary permits, current conditions, and a forum where you can talk to other climbers who are familiar with the gorge. Other interesting spots in the Red River Gorge Geological Area include Chimney Top Rock, which rises about 900 feet above the canyon floor; Angel Windows, an area of large recess caves; Whistling Arch, where the winds make a whistling sound through the formation; and Creation Falls, a beautiful waterfall located in the gorge. While you're in the Red River Gorge area, consider a visit to Gladie Historic Site, a restored early settler's log cabin; the Kentucky Reptile Zoo, where venom is extracted for research purposes; Torrent Falls Family Climbing Adventure, an excellent place to try rock climbing on an engineered vertical path around an immense rock face; and the Red River Historical Museum, where you'll learn even more about the area's history. For a rather unique way of exploring the Red River Gorge, you could consider a bicycling trip. The gorge's spectacular network of hiking trails is off-limits to mountain bikers, but Lexington's Bluegrass Cycling Club organizes a number of area bike rides, including the annual autumn "Red River Rally." This magnificent 27-mile loop tour takes cyclists right through one of the most scenic and significant geological areas in the nation. Of course, you can do this ride on your own at any time, but be prepared for narrow, shoulder-less, twisting mountain roads where you'll face several tough climbs and steep descents. Another enticing way to explore the area is by canoe, for the Red River is a designated wild and scenic river. This adventure trek will take you through a narrow, twisting gorge that's lined by thick forest, huge boulders, and towering sandstone cliffs. 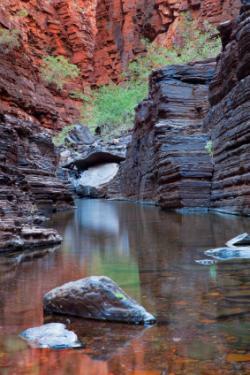 You'll also find several rock climbing and rappelling opportunities available along this route. For example, Tower Rock does not have a designated trail leading to the top, but experienced rock climbers will enjoy this challenge. If you're considering staying overnight, there are countless cabin rentals available. Many of these are managed by specialty cabin rental sites. Prices can vary widely based on location and number of people in your party. In most cases, there is a minimum number of nights required. Scenic Cabin Rentals offers a variety of cabins and operates the Black Bear Motel as well. Since the cabins require two or more nights, the Black Bear Lodge Motel may be a better option since they allow one-night bookings. Black Bear Lodge Rates: Standard pricing is set at $59 for single queen and $79 for double, with a discount offered for three or more nights. Book all 10 rooms for $700 a night. A-Clifftop Haven: Key features include three bedrooms, two baths, wrap around deck, gas grill, fire pit, washer/dryer, and a gas fireplace. The average rate is $250 a night for up to two people with a maximum capacity of six guests. B-Lazy Bear: Cabins feature four bedrooms, three bathrooms, a hot tub, pool table, Internet access, and satellite TV. The average nightly rate is $350 for up to eight people. Red River Gorge Cabin Co.
Bird Nest Cabin: Pets are allowed in this one bedroom, one bathroom cabin that starts at $70 a night. Middle Fork Lodge: Accommodating up to 15 guests, this lodge features three bedrooms and 2.5 baths. Pets are allowed and nightly rates start at $231. Flying Squirrel Tree House: With one bedroom and one bathroom, this lodging is good for up to two guests. Rates start at $67 a night. 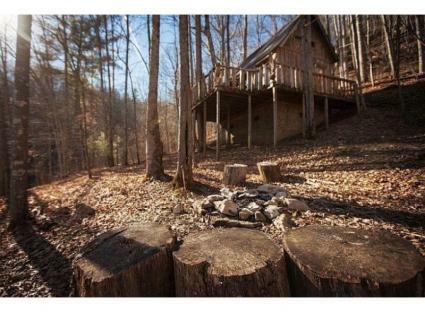 Natural Bridge Cabin Company offers several rentals in the Red River Gorge area as well. It is family owned and they manage both their family-owned cabins and other properties in the area. Gorgeous View: This pet-friendly property includes two bedrooms, two baths, a hot tub, a grill, and a loft with jetted tub. Rates start at $179 a night or $1,050 for a week. Caits: This one bedroom, one bathroom cabin is pet-friendly, featuring a king bed and loft, two queen sized beds, and a sleeper sofa. There is also a hot tub on the deck. This cabin starts at $169 a night or $980 a week. Jordan Cabin: Great for two to three visitors, this pet-friendly cabin has one bedroom and one bathroom. Rates start at $109 a night and $650 a week. Froggy Top: While this studio has no electricity or indoor plumbing, it does have lanterns and an outhouse. It's located on a small catch-and-release fishing lake. Pet friendly, this property is available for as low as $59 a night or $299 a week. Additionally, there are a number of other cabin management companies in the region. These include Red River Gorge Cabin Rentals and Red River Gorgeous Wilderness Cabin Retreat, or check out the selection of private cabin rentals through VRBO. Whether you choose to explore this fascinating area by bike, foot, canoe, or motor vehicle, the Red River Gorge is certainly worth a visit. You'll see for yourself that nature has created a masterpiece here.